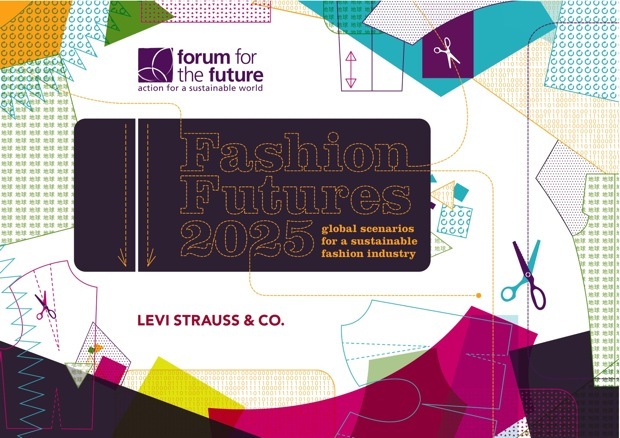 A trend report produced by Forum for the Future and Levi Strauss & Co. allows companies to envision the year 2025 with a workshop guide and a series of clever animations. Amidst the new outfits swishing down runways at this year’s London Fashion Week was a different kind of fashion launch: The British non-profit named Forum for the Future released its sustainability trend report for the industry. But the report, named Fashion Futures 2025, is no endless stack of statistics, like so many other trend reports that seem like they were written to make your eyes glaze over. This innovative toolkit includes a range of free materials, from a workshop guide to entertaining animation, that its creators hope will help the report’s message reach a wider audience. issues like climate change. The key to reaching their fashion-forward audience was to do it in a creative, collaborative way. Reaching out to fashion industry experts from all over the world, Forum for the Future compiled interviews and resources that helped put together a picture of what fashion will look like 15 years from now. Some of the more intriguing ideas poised by Fashion Futures 2025’s 60-page report included business models like clothing libraries where people could rent special occasion or vintage pieces, or high-tech fibers which would be able to repel dirt and grime. Also the question of disposal was an interesting question: If clothes are gently worn but still have valuable fibers, how can pieces be reused or upcycled into something else? Although the report is compiled into a beautifully-designed free, downloadable document, Forum for the Future wanted to take the execution one step further. “We find that almost anyone can produce glossy futures reports,” says Madden. “The really important part is that they’re used.” The concept behind Fashion Futures 2025 was to involve the businesses who could start making these changes, and do it in an interactive manner. 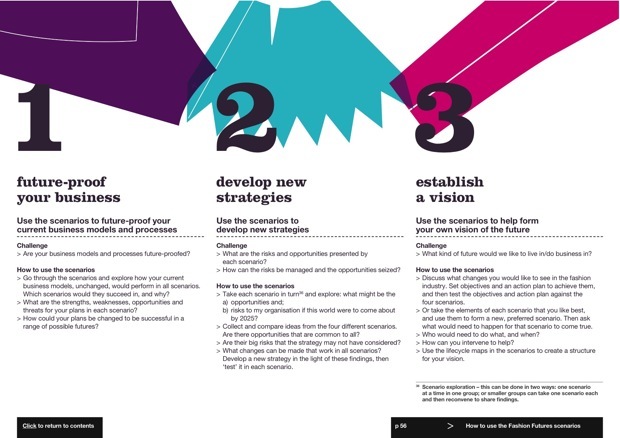 A workshop model was devised so a company of any size could not only read the report but actually use it to assess their current strategies while they looked at where they wanted to take their company. 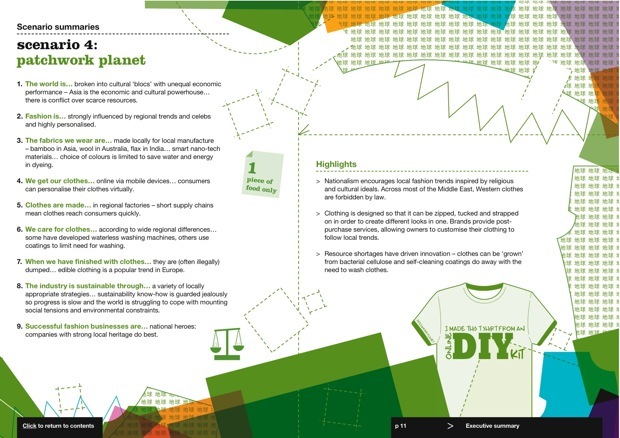 A workshop resource page provides an agenda, exercises and the report in PowerPoint form that allows company leaders to easily present the workshop to their employees, but also take ownership in the process–rather than have a set of standards and rules passed down from an authoritative body. professional associations. Fashion Futures 2025 is aided by a strong partnership with Levi’s Strauss & Co., the iconic 150-year-old fashion brand. donate used clothing to Goodwill. Now, they will also serve as a large test group for implementing the report’s findings, holding workshops within their offices. While they don’t have a formal system set up for feedback from the fashion workshops, Madden expects that they will be hearing stories from companies that use the program. In the meantime, they’re producing a module for fashion schools to use, including a pilot program with the masters program at London College of Fashion and another at California College of the Arts. And they’ll be taking the presentation to fashion industry conferences and schools around the world. Forum for the Future’s track record has been impressive: A travel report produced last year for the UK outbound tourism industry eventually was presented at an international travel conference, resulting in a unified plan and roadmap for that industry’s future. Ultimately, addressing issues of sustainability and fashion affects all designers because of the opportunity to explore the motivation behind concepts like self-expression and happiness–and how that changes consumer behavior, says Madden. “It’s an important lesson for the environmental movement. We can’t talk about a future that’s all about sacrifice and doom and gloom…and then have ugly clothes that are rubbish.” Fashion designers have perhaps the greatest challenge of all, since they have to find sustainable solutions that are beautiful and desirable–and as exciting and ever-changing as the fashion industry itself.